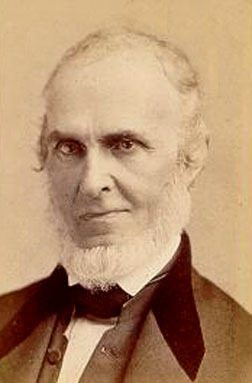 John Greenleaf Whittier, America's "Quaker poet" of freedom, faith and the sentiment of the common people, was born in a Merrimack Valley farmhouse, Haverhill, Massachusetts, on the 17th of December 1807. The dwelling was built in the 17th century by his ancestor, the sturdy immigrant, Thomas Whittier, notable through his efforts to secure toleration for the disciples of George Fox in New England. Thomas's son Joseph joined the Society of Friends and bore his share of obloquy. Successive generations obeyed the monitions of the Inner Light. The poet was born in the faith, and adhered to its liberalized tenets, its garb and speech, throughout his lifetime. His father, John, was a farmer of limited means but independent spirit. His mother, Abigail Hussey, whom the poet strongly resembled, was of good stock. The Rev. Stephen Bachiler, an Oxford man and a Churchman, who became a Nonconformist and emigrated to Boston in 1632, was one of her forebears and also an ancestor of Daniel Webster. The poet and the statesman showed their kinship by the "dark, deep-set and lustrous eyes" that impressed one who met either of these uncommon men. The former's name of Greenleaf is thought to be derived from the French Feuillevert, and to be of Huguenot origin; and there was Huguenot blood as well in Thomas Whittier, the settler. The poet thus fairly inherited his conscience, religious exaltation and spirit of protest. All the Whittiers were men of stature and bodily strength, John Greenleaf being almost the first exception, a lad of delicate mould, scarcely adapted for the labor required of a Yankee farmer and his household. He bore a fair proportion of it, but throughout his life was frequently brought to a halt by pain and physical debility. In youth he was described as "a handsome young man, tall, slight, and very erect, bashful, but never awkward." His shyness was extreme, though covered by a grave and quiet exterior, which could not hide his love of fun and sense of the ludicrous. In age he retained most of these characteristics, refined by a serene expression of peace after contest. His eyes never lost their glow, and were said by a woman to be those of one "who had kept innocency all his days." Whittier's early education was restricted to what he could gain from the primitive "district school" of the neighborhood. His call as a poet came when a teacher lent to him the poems of Robert Burns. He was then about fifteen, and his taste for writing, bred thus far upon the quaint Journals of Friends, the Bible and The Pilgrim's Progress, was at once stimulated. There was little art or inspiration in his boyish verse, but in his nineteenth year an older sister thought a specimen of it good enough for submission to the Free Press, a weekly paper which William Lloyd Garrison, the future emancipationist, had started in the town of Newburyport. This initiated Whittier's literary career. The poem was printed with a eulogy, and the editor sought out his young contributor: their alliance began, and continued until the triumph of the anti-slavery cause thirty-seven years later. Garrison overcame the elder Whittier's desire for the full services of his son, and gained permission for the latter to attend the Haverhill academy. To meet expenses the youth worked in various ways, even making slippers by hand in after-hours; but when he came of age his textbook days were ended. Meanwhile he had written creditable student verse, and contributed both prose and rhyme to newspapers, thus gaining friends and obtaining a decided if provincial reputation. He soon essayed journalism, first spending a year and a half in the service of a publisher of two Boston newspapers, the Manufacturer, an organ of the Clay protectionists, and the Philanthropist, devoted to humane reform. Whittier edited the former, having a bent for politics, but wrote for the latter also. His father's last illness recalled him to the homestead, where both farm and family became his pious charge. Money had to be earned, and he now secured an editorial post at Hartford, Connecticut, which he sustained until forced by ill-health, early in his twenty-fifth year, to re-seek the Haverhill farm. There he remained from 1832 to 1836, when the property was sold, and the Whittiers removed to Amesbury in order to be near their meeting-house and to enable the poet to be in touch with affairs. The new home became, as it proved, that of his whole later life; a dwelling then bought and in time remodeled was the poet's residence for fifty-six years, and from it, after his death on the 7th of September 1892, his remains were borne to the Amesbury graveyard. While in Hartford Whittier issued in prose and verse his first book, Legends of New England (1831), and edited the writings of the poet John Gardiner C. Brainard. From this point forward he was constantly printing verse, but of the hundred or more pieces composed before his settlement at Amesbury less than fifty are retained in his final collection. Of these none has more significance than the poem to Garrison, which appeared in 1831, and was read (December 1833) at the Philadelphia Convention that formed the Anti-Slavery Society. To that convention, with one-third of its membership composed of Friends, Whittier was a delegate, and was appointed one of the committee that drafted the famous Declaration of Sentiments. Although a Quaker, he had a polemical spirit; men seeing Whittier only in his saintly age knew little of the fire wherewith, setting aside ambition and even love, he maintained his warfare against the "national crime", employing action, argument and lyric scorn. A future was open for him among the Protectionists, who formed the Whig party, and doubtless soon would have carried him to the United States Congress. As it was, he got no farther than the legislature of his own state (1835-36), elected by his neighbors in an anti-slavery town. But if Garrison, Phillips and Sumner and Stowe were to be the rhapsodists of the long emancipation struggle, Whittier was its foreordained poet-seer. In 1833 he had issued at his own cost a pamphlet, "Justice and Expediency", that provoked vehement discussion North and South. Later he shared with the agitators their experience of lawlessness, mob violence and political odium. His sister Elizabeth, who became his life companion, and whose verse is preserved with his own, was president of the Woman's Anti-Slavery Society in Amesbury. It is to be noted that the first collection of Whittier's lyrics was the Poems written during the Progress of the Abolition Question in the United States, issued by a friend in 1837. But Mogg Megone (1836) was his first book, a crude attempt to apply the manner of Sir Walter Scott's romantic cantos to a native theme. Among his other lyrical volumes, of dates earlier than the Civil War, were Lays of my Home (1843), Voices of Freedom (1846), Songs of Labor (1850), The Chapel of the Hermits (1853), The Panorama (1856), Home Ballads (1860). The titles of In War Time (1863) and National Lyrics (1865) rightly designate the patriotic rather than Tyrtaean contents of these books. The poet was closely affiliated with the Atlantic Monthly from the foundation of that classic magazine in 1857. His repute became national with the welcome awarded to Snow-Bound in 1866, and brought a corresponding material reward. Of his later books of verse may be mentioned The Tent on the Beach (1867), The Pennsylvania Pilgrim (1872), The Vision of Echard (1878), The King's Missive (1881), At Sundown, his last poems (1890). As early as 1849 an illustrated collection of his poems appeared, and his Poetical Works was issued in London in 1850. During the ensuing forty years no less than ten successive collections of his poems appeared. Meanwhile he did much editing and compiling, and produced, among other works in prose, The Stranger in Lowell (1845), Supernaturalism in New England (1847), Leaves from Margaret Smith's Journal (1849), a pleasing treatment in old-style English of an early Colonial theme. When he died, in 1892, in New Hampshire, among the hills he loved and sang so well, he had been an active writer for over sixty years, leaving more than that number of publications that bore his name as author or editor. His body was brought to Amesbury for interment; the funeral services were held in the open air, and conducted after the simple rites of the Friends, in the presence of a large concourse, certain of whom "spake as they were moved" in tribute to the bard. The Amesbury house has been acquired by the "Whittier Home Association", so that the building and grounds are guarded as he left them, and form a shrine to which there is a constant pilgrimage. TheHaverhill homestead, memorized in Snow-Bound, is also held by trustees "to preserve the natural features of the landscape", and to keep the buildings and furniture somewhat as they were in their minstrel's boyhood. It would be unjust to consider Whittier's genius from an academic point of view. British lovers of poetry -- except John Bright and others of like faith or spirit -- have been slow to comprehend his distinctive rank. As a poet he was essentially a balladist, with the faults of his qualities; and his ballads, in their freedom, naivit�, even in their undue length, are among the few modern examples of unsophisticated verse. He returned again and again to their production, seldom laboring on sonnets and lyrics of the Victorian mould. His ear for melody was inferior to his sense of time, but that his over-facility and structural defects were due less to lack of taste than to early habit, Georgian models, disassociation from the schools, is indicated by his work as a writer of prose. In Margaret Smith's Journal an artistic, though suppositive, Colonial style is well maintained. Whittier became very sensible of his shortcomings; and when at leisure to devote himself to his art he greatly bettered it, giving much of his later verse all the polish that it required. In extended composition, as when he followed Longfellow's Tales of a Wayside Inn with his own Tent on the Beach, he often failed to rival his graceful brother poet. In American balladry he was pre-eminent; such pieces as "The Swan Song of Parson Avery", "Marguerite", "Barclay of Ury", "Skipper Ireson's Ride", "In the Old South", hold their place in literature.. It is necessary above all to consider the relation of a people's years of growth and ferment to the song which represents them; for in the strains of Whittier, more than in those of any other 19th-century lyrist, the saying of Fletcher of Saltoun as to the ballads and laws of a nation finds a historic illustration. He was the national bard of justice, humanity and reform, whose voice went up as a trumpet until the victory was won. Its lapses resembled those of Elizabeth Barrett Browning, who was of his own breed in her fervor and exaltation. To the last it was uncertain whether a poem by Whittier would "turn out a sang", or "perhaps turn out a sermon"; if the latter, it had deep sincerity and was as close to his soul as the other. He began as a liberator, but various causes employed his pen; his heart was with the people, and he was understanded of them; he loved a worker, and the Songs of Labor convey the zest of the artisan and pioneer. From 1832 to 1863 no occasion escaped him for inspiring the assailants of slavery, or chanting paeans of their martyrdom or triumph. No crusade ever had a truer laureate than the author of "The Virginia Slave Mother", "The Pastoral Letter" -- one of his stinging ballads against a time-serving Church -- "A Sabbath Scene", and "The Slaves of Martinique." "Randolph of Roanoke" is one of the most pathetic and most elevated of memorial tributes. "Ichabod" and "The Lost Occasion", both evoked by the attitude of Webster, are Roman in their condemnation and "wild with all regret." The green rusticity of Whittier's farm and village life imparted a bucolic charm to such lyrics as "In School Days", "The Barefoot Boy", "Telling the Bees", "Maud Muller", and "My Schoolmate." His idyllic masterpiece is the sustained transcript of winter scenery and home life, Snow-Bound, which has had no equal except Longfellow's "Evangeline" in American favor, but, in fact, nothing of its class since "The Cottar's Saturday Night" can justly be compared with it. Along with the Quaker poet's homing sense and passion for liberty of body and soul, religion and patriotism are the dominant notes of his song. His conception of a citizen's prerogative and duty, as set forth in "The Eve of Election", certainly is not that of one whose legend is "our country, right or wrong." Faith, hope and boundless charity pervade the "Questions of Life", "Invocation", and "The Two Angels", and are exquisitely blended in "The Eternal Goodness", perhaps the most enduring of his lyrical poems. "We can do without a Church", he wrote in a letter; "we cannot do without God, and of Him we are sure." The inward voice was his inspiration, and of all American poets he was the one whose song was most like a prayer. A knightly celibate, his stainless life, his ardor, caused him to be termed a Yankee Galahad; a pure and simple heart was laid bare to those who loved him in "My Psalm", "My Triumph" and "An Autograph." The spiritual habit abated no whit of his inborn sagacity, and it is said that in his later years political leaders found no shrewder sage with whom to take counsel. When the question of primacy among American poets was canvassed by a group of the public men of Lincoln's time, the vote was for Whittier; he was at least one whom they understood, and who expressed their feeling and convictions. Francis Parkman called him "the poet of New England", but as the North and West then were charged with the spirit of the New England states, the two verdicts were much the same. The fact remains that no other poet has sounded more native notes, or covered so much of the American legendary, and that Whittier's name, among the patriotic, clean and true, was one with which to conjure. He was revered by the people cleaving to their altars and their fires, and his birthdays were calendared as festivals, on which greetings were sent to him by young and old. In his age the poet revised his works, classifying them for a definitive edition, in seven volumes, published at Boston, 1888. Their metrical portion, annotated by Horace E. Scudder, can be found in the one-volume "Cambridge Edition," (Boston, 1894). Whittier's Life and Letters, prepared by his kinsman and literary executor, Samuel T. Pickard, also appeared in 1894.